Presents the state of current research on the inter-relationships between global tectonics and macroscale landscape development across a wide range of topics and study areas. The last 10 years have witnessed a remarkable growth in interest in the relationships between global tectonics and the Earth's maroscale topographic features. This new research emphasis has emerged from a range of practitioners within the earth sciences, including geophysicists concerned with what can be learnt about tectonic processes from their topographic effects, geologists interested in the factors controlling erosion and the supply of material to sedimentary basins, and geomorphologists wanting to understand the role of tectonics in landscape evolution. Various technical developments and new sources of data have also contributed to these developments, such as the construction of coupled tectonic surface process numerical models of large-scale landscape development, the creation of large-area, high resolution digital elevation models, and the derivation of long-term denudational records using methods such as thermochronology. This book presents an overview of innovative research in the area and provides directions for future research. Each chapter provides up-to-date surveys of key research questions, reports on important current work and highlights outstanding research issues. It will be invaluable to those across the earth science community who are interested in the relationships between tectonics and geography. 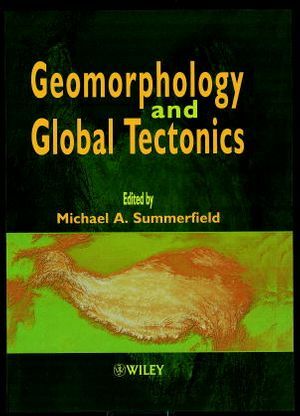 Michael A. Summerfield is the author of Geomorphology and Global Tectonics, published by Wiley. Geomorphology and Global Tectonics: Introduction (M. Summerfield). GENERAL MODELS AND EMPIRICAL APPROACHES. Application of Digital Elevation Models to Macroscale Tectonic Geomorphology (L. Mayer). Coupled Tectonic-Surface Process Models with Applications to Rifted Margins and Collisional Orogens (C. Beaumont, et al.). Fission-Track Thermochronology and the Long-Term Denudational Response to Tectonics (A. Gleadow & R. Brown). Macroscale Process Systems of Mountain Belt Erosion (N. Hovius). MORPHOTECTONIC EVOLUTION IN INTERPLATE SETTINGS. Geodynamic Processes in the Southern Alps, New Zealand (J. Tippett & N. Hovius). Morphotectonic Evolution of Taiwan (J.-C. Lin). Morphotectonic Evolution of Japan (H. Ohmori). Large-Scale Geomorphology of the Andes: Interrelationships of Tectonics, Magmatism and Climate (L. Kennan). Morphotectonic Evolution of the Himalayas and Tibetan Plateau (E. Fielding). MORPHOTECTONIC EVOLUTION IN INTRAPLATE SETTINGS. Geomorphological Evolution of the East Australian Continental Margin (P. Bishop & G. Goldrick). Morphotectonic Evolution of the South Atlantic Margins of Africa and South America (R. Brown, et al.). Late Cenozoic Landscape Evolution of the US Atlantic Passive Margin: Insights Into a North American Great Escarpment (F. Pazzaglia & T. Gardner). Linking Tectonics and Landscape Development in a Passive Margin Setting: The Transantarctic Mountains (A. Kerr, et al.). Morphotectonic Evolution of the Western Ghats, India (Y. Gunnell & L. Fleitout). The Growth and Decay of Oceanic Islands (A. Watts).